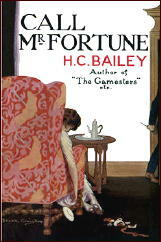 H. C. BAILEY – Call Mr. Fortune. Methuen & Co. Ltd., UK, hardcover, 1920. E. P. Dutton, US, hardcover, 1921. Mckinlay Stone & Mackenzie, hardcover, 1921. Macdonald, UK, hardcover, 1949. This is the first collection of Reginald Fortune short stories and, if the problems I had getting a copy are any indication, the scarcest one. Six stories are in this volume, and they range in quality from very good to excellent. There are, I might add, no bad or even poor Fortune short stories in any of the collections. Fortune investigates usually with great reluctance and frequent complaints. In one case he says, “I believe the beggars get murdered just to bother me” and “They only do it to annoy because they know it teases.” Indeed, at one point he is “elaborating a scheme by which the murder and the cricket seasons should be conterminous.” In those cases where he willingly joins in the chase, children or friends are usually involved. Fortune is not to everyone’s tastes. He, like most males, hasn’t really matured, only he never pretends that he has. While he is something of a gourmet, he has a penchant for sweets and muffins. He likes to play with puppets and write his own scenarios. Cold and discomfort he complains about bitterly, as would a small boy, particularly when he is taken away from his toys or his leisure, and when he drives an automobile it is with the complete abandon of youth. Certainly even less mature, however, are Stanley Lomas of the Criminal Investigation Department and the various policemen that Fortune works with. Despite the unfailing accuracy of the Fortune eye and intellect, they continue to scout his ideas and ignore his warnings. Read this collection, if you can find it, or any of the Fortune short story collections. Each puzzle in all of the books ranges from good to superb. And if Reggie irritates you in the beginning, as he did me when I first read him 30 years ago, you may find, as I did, that he grows upon you if he is given a chance. Editorial Comment: Bill was quite right about the price of a First Edition of this book, a “Queen’s Quorum” title — there is one currently offered for sale on ABE for $500 — but I doubt that he suspected a future in which those of you with a Kindle could have a copy zapped to you in seconds for only 99 cents. People should stick with the Fortune stories, because many of them are quite good. Reggie does seem to irritate a lot of people though! Do you mean stick with the Fortune short stories, rather than the novels; or stick with the Fortune stories over the Joshua Clunk ones? Or download it for free from Munseys.com, which is probably wherever the person trying to sell it on Amazon got it from. That happens a lot. The puerility of Bailey’s characters – here and elsewhere – reminded me of Lord Peter Wimsey at his worst. But with your recommendation I shall extract the volume from the wall, and try again! I think Bill was as right as he could be when he suggested that Bailey is not to everyone’s taste. He was popular in his day, but he and his characters can be a tough slog for anyone coming across his work today. If you try again, I hope you’ll report back…!